The Canadian Rockies Put the Mountain in Mountain Biking. Time to Shred (or Hammer, if You’re into Road Cycling)! If you’re into mountain biking then you are probably already familiar with the Canadian Rockies. If you are into biking and aren’t, then you should be, because we have some the best mountain biking in the world here, whether you’re into downhill or cross country. You know all those mountains in Banff National Park and elsewhere in Western Canada that are covered in snow and criss-crossed with downhill and cross-country skiing in winter? Well guess what? In summer, when the snow melts, a lot of these trails are open to mountain bikes. So bring your bike and be prepared to shred some singletrack or bomb down some seriously righteous downhill. Don’t want to mess with dragging your bike on hour vacation or holiday getaway? No problem; rental bikes are available at several shops and outfitters in Banff town. Those mountains aren’t just for the mountain bikers, either, if fat tires are not your kind of cycling. Don’t fret roadies, we’ve got some roadways here that would rival Mount Ventoux and French Alps for two-wheeled climbing and descents. If you like to suffer through a hammer-fest and then enjoy the white-knuckle ride down the other side, there is plenty of that around Banff. Plus, a bicycle is a great way to get around Banff town; as of 2010 Banff saw the addition of sharrows – shared lane marking — which will help motorists and bicyclists navigate our roads. Banff also features several paved pathways, and bike racks are abundant along the main downtown streets. Of course outside of town, whether you prefer spandex and racing slicks or baggy shorts and knobbies, a bicycle is an excellent way to take in the scenic beauty of Banff National Park and the Canadian Rockies. 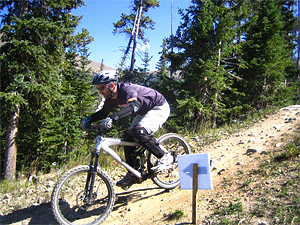 There are several trails open for riding inside the park, and most of these are accessible from Banff town. Other local favorites are at Lake Minnewanka and further north in Lake Louise. For more info on mountain biking in Banff National Park, you can check the Parks Canada website, as well as the Bow Valley Mountain Bike Alliance. If you’re a roadie or into bike touring, there are several options for you originating in Banff, ranging from one hour to several days in length. Shorter rides originating from the town include the trail along the Bow River, Vermilion Lakes Drive and a loop around Tunnel Mountain or Lake Minnewanka Road. Climbers will enjoy riding the road up Mount Norquay (approximately 5 kilometers from the Highway 1 exit to the Ski Norquay parking lot). More ambitious rides include the Bow Valley Parkway to Lake Louise and back (approximately 120 kilometers round trip). There are several local tour operators who provide guided bicycle tours. 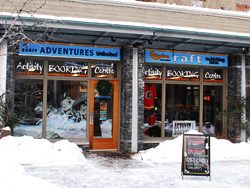 We can recommend Banff Travel if you’re looking to rent full suspension or hard-tail mountain bikes.